The Coat of Arms in the hoist of the flag aren't the full-blown version of the Coat of Arms of Serbia- they are, 'the lesser coat of arms' but no less significant in their meaning. The white, double-headed eagle is a symbol of Serbia that dates back as far as 1190- though its roots may go all the way back to Byzantium itself. 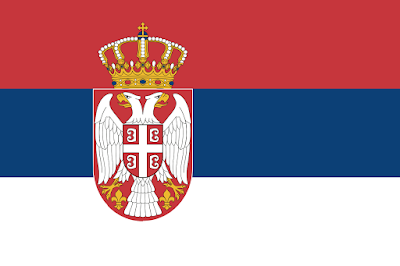 The cross on the shield has been a symbol of Serbia since 1345- despite being a Republic, the crown of the former monarchy appears above the shield.